You have seven cervical vertebrae (neck bones) responsible for holding up your head. All mammals seem to have seven cervical vertebrae except for sloths and manatees. Individuals with more or less tend to die. But sometimes, the bottom vertebra grows little rib bones, which are usually harmless themselves but could be a signal that some other things are very wrong, genetically. 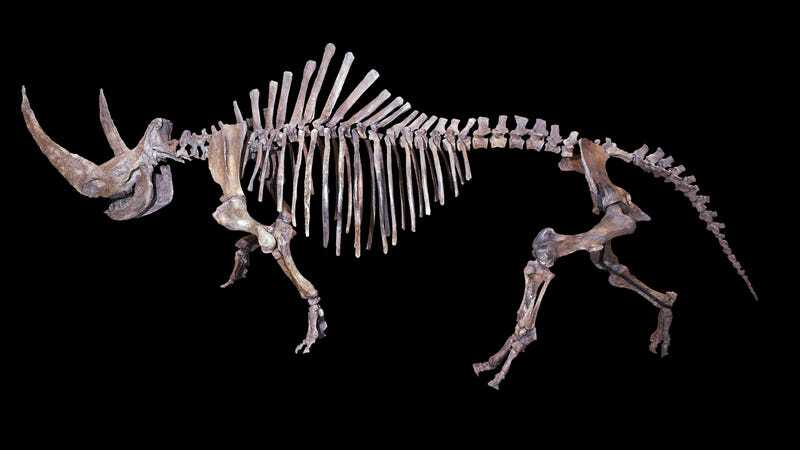 A new study looking at Coelodonta antiquitati, the extinct wooly rhino from the area that’s now the North Sea and the Netherlands, found that the number of individuals with these cervical ribs was especially high—a condition that probably brought about their demise. The wooly rhino was around as late as 30,000 years ago and appears in cave paintings. Obviously, it is not around anymore. The researchers analyzed 32 wooly rhino C7 vertebrae, the bottom ones that might sprout the bum ribs, looking for the presence of a facet where the rib should have connected. The team found five vertebrae that would have contained ribs, 24 normal ones, and three with one or two characteristics of a ribbed vertebra. That comes in comparison to the 56 specimens of extant rhinos they looked at, none of which showed signs of ribbin’ in their C7. “Ribbin’ in my C7" is a pop song I am now working on. So, what’s going on? It’s possible the high incidence of weird ribs was just an experimental stage in rhino evolution, according to the paper. But the study’s authors found that unlikely, since they couldn’t come up with an evolutionary advantage of a shorter neck, and only very slow-moving species seem to have fewer than seven cervical vertebrae. In humans, at least, these neck-ribs usually mean that something bad happened some time while an embryo was developing, either genetically or environmentally. The ribs are presently associated with a problem with the genes that govern the overall appearance of the body, and might be a sign of other genetic issues as well. There’s probably more work to do before making any conclusions, though. As Humboldt University paleozoologist Johannes Müller told Science News, “there are no comparisons [of neck vertebrae] through time.” Basically, there’s not a way to tell if and how this feature evolved. He suggested that the authors look at whether the rhinos had these extra vertebrae during times when they were more common on Earth. Regardless, things just stink for some species. Sorry, wooly rhinos, you just weren’t cut out for this world.